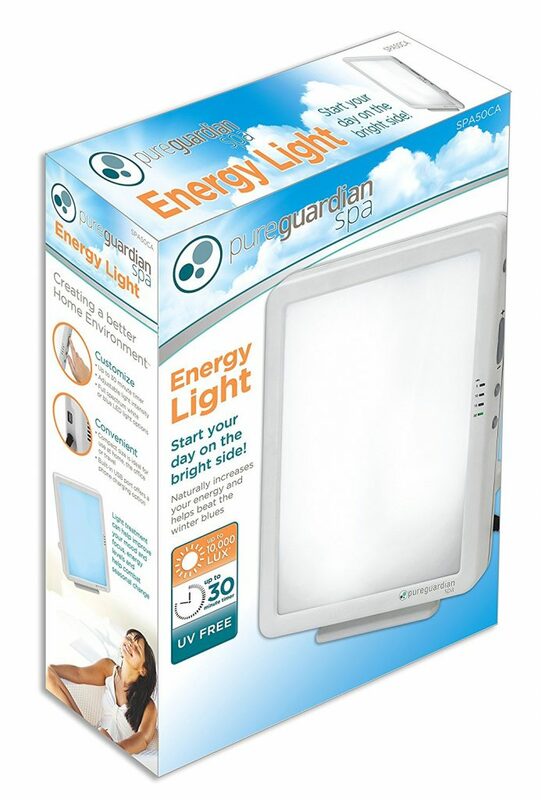 The PureGuardian SPA50CA Energy Light is good value for the price, as it essentially doubles as two light therapy devices. Though it does have its issues, most of them are minor or based on opinion. It can be noisy, but it has a USB charging port. Customer service for the manufacturer is excellent, so any issue you might encounter with the lamp will be addressed in a timely manner should one arise. In my opinion, this is the lamp you would probably get the most out of; there are no bulbs to replace, two light colors, three brightness settings, and four different timer intervals. The design could be flashier but what it lacks in design, it makes up in function. 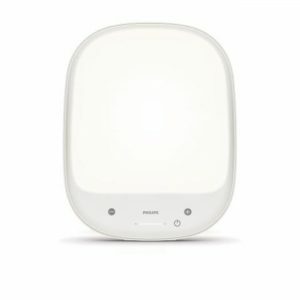 This is a solid light therapy device by a well-renowned company with wonderful customer service. Guardian Technologies specializes in appliances to make home happier and healthier. 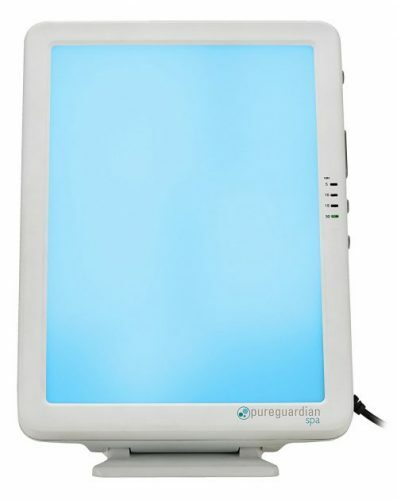 The PureGuardian Energy Light is their only light therapy device, as they mainly make diffusers, humidifiers, and air purifiers. The lamp is 6.75 x 5 x 9.5 inches and just over a pound. The lamp sits on a small base and the light itself rotates forward and backwards on the stand. 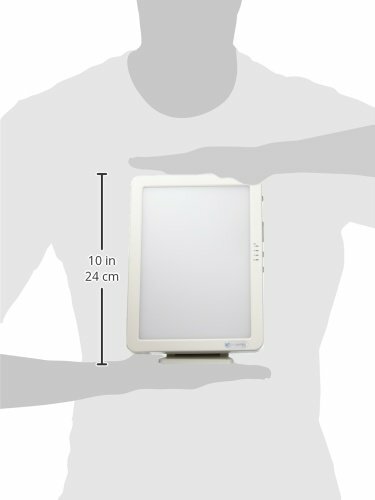 Guardian Technologies recommends sitting the lamp at a 90 degree or 70-degree angle. There are four buttons on the right side of the lamp with lights to indicate which setting is selected. The plastic used to make the lamp is thin and it does appear to be cheaply made. 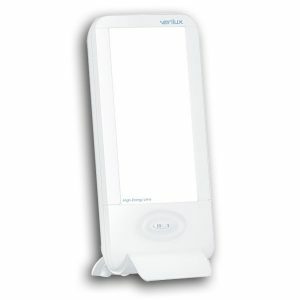 The lamp looks very much like a medical device and does not seem like it would blend into most aesthetic looks well. However, it is small and compact and would travel very easily. The manual can be downloaded from the manufacturer’s website and is presented in three languages. The PureGuardian Energy Light is assembled and ready to be plugged in straight out of the box. The power button turns the lamp on, and there are separate buttons for the brightness settings and the light color settings. 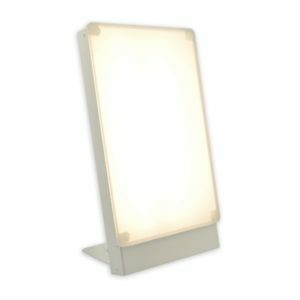 Though this lamp boasts 10k lux, there seems to be a 2k lux deviation – on the highest setting, the white light could be 8k lux or 12k, depending on the unit. This is something to be mindful of, but it’s a pretty solid range. Unfortunately, the blue light setting only puts out between 1,400 and 3,700 lux. While this setting is easier on your eyes you would need almost three times the treatment length for it to be effective. That said, the highest lux output is achieved at 8 inches on the highest brightness and the white light setting. Guardian Technologies recommends sitting between 12 and 16 inches from the lamp at all times. Some customers have found that the device emits a high-pitched humming sound when on the white light setting. I heard the sound from my device but for me, it was not overwhelming enough to be more than a small issue. Guardian Technologies does offer to replace the lamp if this is something that cannot be tolerated. They are working on solving the problem and their customer service is stellar, so if this is an issue that really bothers you or occurs in your unit I am sure they would be happy to help. 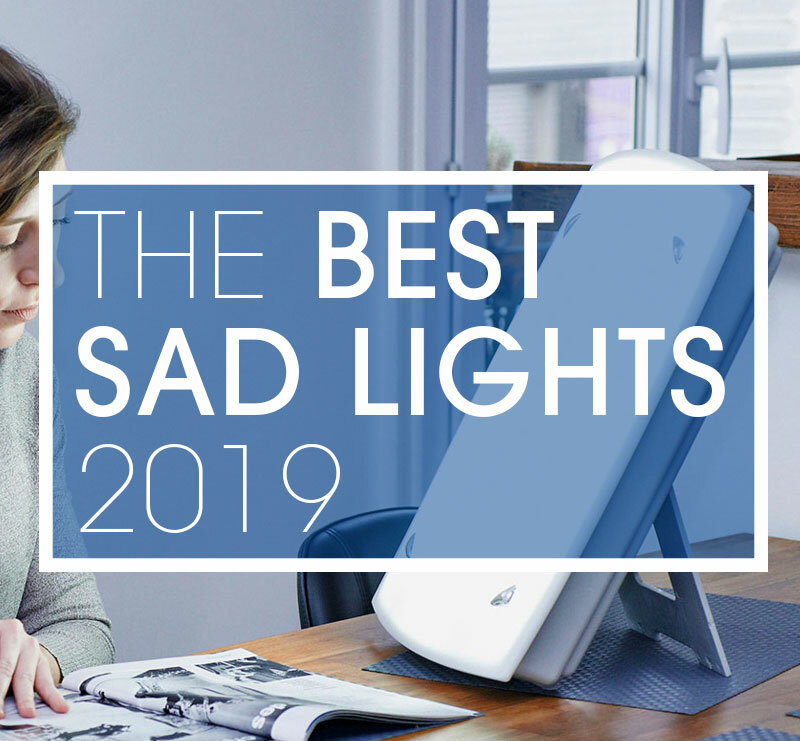 Overall, this lamp works well as both a white light therapy device and a blue light therapy device, which is a pretty unique feature and will save you money if you need or want to have both on hand. This lamp has two different colored lights, white and blue. 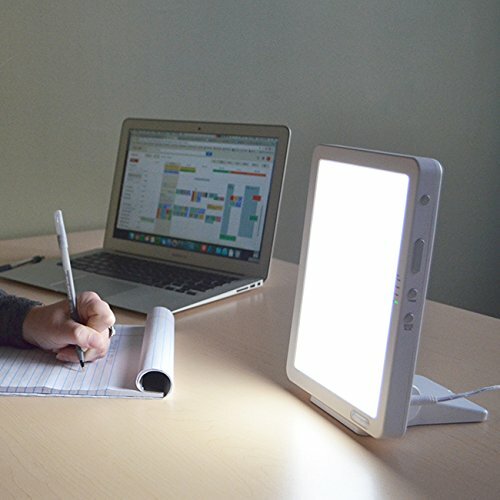 This eliminates the need to buy two separate light therapy devices. There are three brightness settings that are usable with each light color, providing six separate light settings. The device has a timer built-in. You can set the lamp to stay on for 5, 10, 15, or 30 minutes at a time. The only drawback to this system is there is no internal memory, so there’s no way to set it up to come on at a certain time. Settings will need to be reset every time the unit is turned on. The unit features a USB charging port on the backside, allowing you to charge your phone or another device while the lamp is on. This feature is unique to this lamp. The price-point is also a bonus – it comes in at midrange for lamps of this size. With the added light color setting, it is an excellent value. The lights inside the face of the lamp are LED and will not ever need replacing. The light is full-spectrum. The light temperature varies due to color, but it comes in at about 5,500 K for white light and 17,000 K for the blue light setting.